Today, slideshows are a popular way to share family and travel pictures. 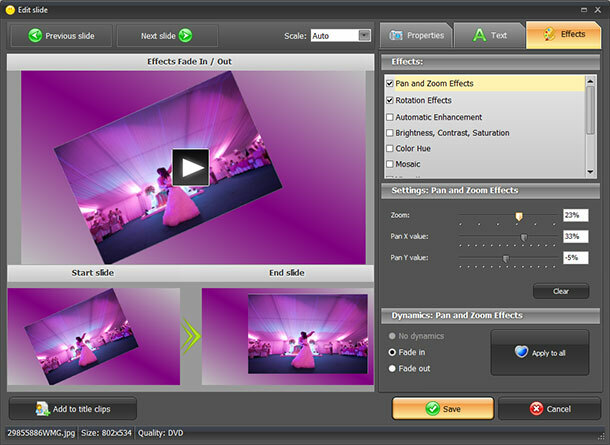 Modern slideshow software has plentiful tools to create breathtaking movies from still images. Do you want to master these tools? Then, keep on reading! In this lesson we’ll share some tricks for using motion effects in a slideshow. Start Photo Slideshow Creator and add your photos. To apply animation effects, you’ll need to open Edit Slide window. Double-click on the slide – this will open Properties tab where you can resize or move the picture and set slide duration. 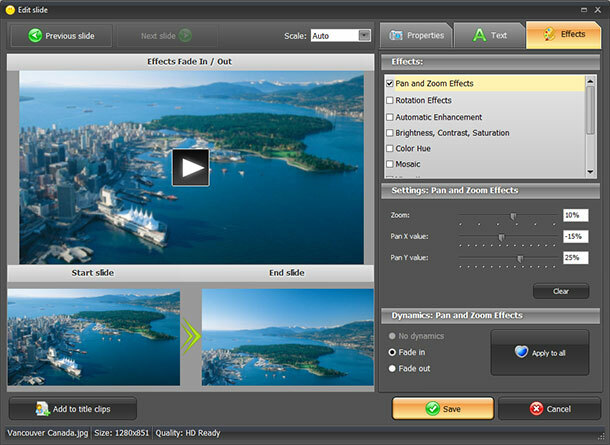 Switch to Effects tab – there you’ll see the full list of animation effects. Check the box next to the desired effect to apply it. It’s possible to apply several effects at a time. The most popular animation effects are pan & zoom. Let’s learn to work with their settings. Pan effect imitates the imaginary camera eye moving across the picture, and up or down. It has two settings: "X" which defines horizontal movement, and "Y" responsible for vertical movement. X value can be set to positive, from 1% to 100% - that’s for moving the “camera eye” to the right, and negative, from -1% to -100% for moving to the left. Same goes for Y value: when it’s positive, the “camera eye” will move down the picture, gradually revealing its bottom part, and vice versa. The zoom effect imitates the "camera eye" approaching the picture or moving away from it. For the latter you need to make the zoom value negative, i.e. from -1% to -100%. When zoom value is greater than 0, the "camera eye" approaches the scene. Another impressive motion effect is rotation. To apply it, check the box Rotation Effects in the effects list. There is one setting – rotation angle. Again, the value may be positive or negative. When it’s greater than 0, i.e. from 1° to 360°, the slide will be rotated counterclockwise. When it’s negative, the rotation will happen clockwise. The Effects window of Photo Slideshow Creator has two images on the bottom left: Start slide and End slide. 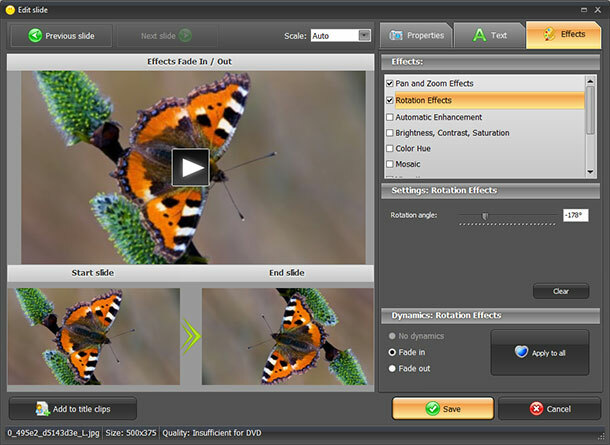 When you change pan & zoom values or rotation angle, you can notice the picture with the end slide changing. There is also a large preview window with Play button in the middle. When you’ve set all the values, click Play to preview the animation effects in action. If it's all right, click Save and move on to the next slide. You may also click Apply to all first to use the same effects for all slides. When you apply pan & zoom or rotation and set the values high, the black edges beyond the photo will be made visible when the slide is played. There are three ways to avoid black edges. One is to stretch the image in advance so it occupies some area beyond the slide edge. Another way is increasing zoom. Both of these work fine if there are no important details near the slide edges. Otherwise try the third way: set some colorful background – you can do it in Properties tab. Panoramic motion looks best when it is shown at a slow speed. Therefore it is better to set slide duration to at least 5 seconds. You can change slide duration in Properties tab. As regards zoom and rotation, you can make them either slow or dynamic – depending on the general slideshow mood, the soundtrack, etc. Make unforgettable photo movies of your own with Photo Slideshow Creator!